It seems people really got interested in the security of phpLiteAdmin. That’s cool, lots of people searching for security issues will give us the opportunity to fix a lot of things in a short period of time. Go on searching. We’ll go on fixing. But some of these exploiters only publish an “exploit” that contains no real issue at all. Probably only to get some publicity, or maybe because they don’t even realize that what they “found” is not an issue at all. Or meant as a joke? Okay yeah. We know exploiters love ASCII art. Kind of cool, agreed. # F-ck HaCking, Lov3 Explo8ting ! # allintext:"Powered by phpLiteAdmin | "
to inject some remote SQL command/code , and Disclosure the Full Path. I didn’t know we call it an “Authentication Bypass” if we use the authentication system by entering the correct password. Yeah, phpLiteAdmin has a default password, which is “admin”. No secret here. I mean, anybody keeping the default password on a publicly accessible installation should know that other people could get access. Current version of phpLiteAdmin even shows you a warning if you still use the default pw. No “bug” or “vulnerability” at all. Warning: SQLiteDatabase::queryExec() [sqlitedatabase.queryexec]: Cannot execute empty query. Okay, seriously: We could use ini_set to make sure phpLiteAdmin won’t show any php errors. We probably will. But nevertheless, on about any php-server, you’ll find another script where you can provoke a php-error. I am not saying it is good that these errors can happen at all. Of course it’d be better to improve checking of input and catch errors properly. This would be a real issue. But not a “vulnerability”. If these errors get displayed, your webserver is configured in a vulnerable way, which is not the fault of phpLiteAdmin. If you publish an SQL injection exploit, why don’t you insert some real SQL as a proof of concept? Maybe because what you “found” here in fact is no SQL injection at all? The function quote_id() will make sure you cannot inject some other SQL command. Of course you can “inject” some invalid table-name, which will make phpLiteAdmin show up some errors, as your “proof image” shows. So another complicated way of producing an error message. Congratulations! But you cannot inject a “DROP Table” here or something like that. Moreover, it is ridiculous to even search for an SQL injection in phpLiteAdmin. If you are logged into phpLiteAdmin, you can of course perform any SQL command. That is what phpLiteAdmin is made for. 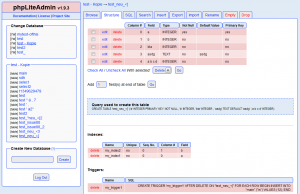 It even gives you a GUI to perform SQL queries in a comfortable way. No need to inject them via parameters. As long as you cannot inject an SQL query without authenticating properly, any “SQL injection” in phpLiteAdmin is not a security vulnerability but a normal issue. If some table has a special name, e.g. containing quotes, we need to make sure the name is escaped properly so phpLiteAdmin works as expected. But this is not the case here: quote_id() will make sure every table-name will be escaped properly. No issue here at all. and click 'GO' to exec ;) . LOL. That’s a really funny one. You might call this a vulnerability, I’d call it a feature. Don’t you show yourself here that issue 3 is ridiculous? So I am not sure if this exploit really was meant seriously or if it was meant as a joke. It made me laugh anyway. I hope you enjoyed it as well. Keep on exploiting! It seems currently people have a very close look at security of phpLiteAdmin. This is really good. We immediately fix any security issue we get aware of. Therefore, we yesterday released another security patch with version 1.9.3.3. The security issue fixed in this version is an XSS vulnerability. The risk of this particular issue is considered medium. All users of phpLiteAdmin < 1.9.3.3 are advised to update to the new version. Users of the development version of 1.9.4 should please update to the latest revision from svn, at least revision 317 (2013-01-14). We are really sorry for those users who needed to update phpLiteAdmin three times in the last days. But the only way to solve security issues is to patch, just ignoring them will not help. Thanks a lot to Urd for making us aware of this issue. If anybody thinks he found a security issue, please do as Urd did and contact us. To update phpLiteAdmin, just download the new version, adjust the configuration and replace the phpliteadmin.php with the new one. Yesterdays security release for phpLiteAdmin unfortunately did not fix the security issues described by an exploit published by “l@usch” completely. Therefore, today a new release 1.9.3.2 was published to cover the remaining issues. All users of phpLiteAdmin < 1.9.3.2 are advised to update their installation to 1.9.3.2. The fixed security issues can only be used by users with access to phpLiteAdmin, i.e. users that know the password. As a general recommendation, you should always use a secure password an keep it secret. Never use the default password on a publicly accessible installation. I’d like to thank l@usch for reporting the issue and his cooperation to resolve it. To update, just download the new version, adjust the configuration and replace your old phpliteadmin.php with the new one. Today, a security issue of phpLiteAdmin was discovered and published. The new version 1.9.3.1, which has just been released, fixes this issue. All users of phpLiteAdmin are recommended to update their installation to the current version 1.9.3.1. The security issue can only be used by users with access to phpLiteAdmin, i.e. users that know the password, to gain more rights on the system. Therefore, the issue cannot be exploited if you use a strong password an keep it secret. For this reason, this is always recommended. Please never use the default password if phpLiteAdmin is publicly accessible over the internet. To update phpLiteAdmin, just adjust the configuration in the new version and replace the phpliteadmin.php with the new one. Done in a minute or two. 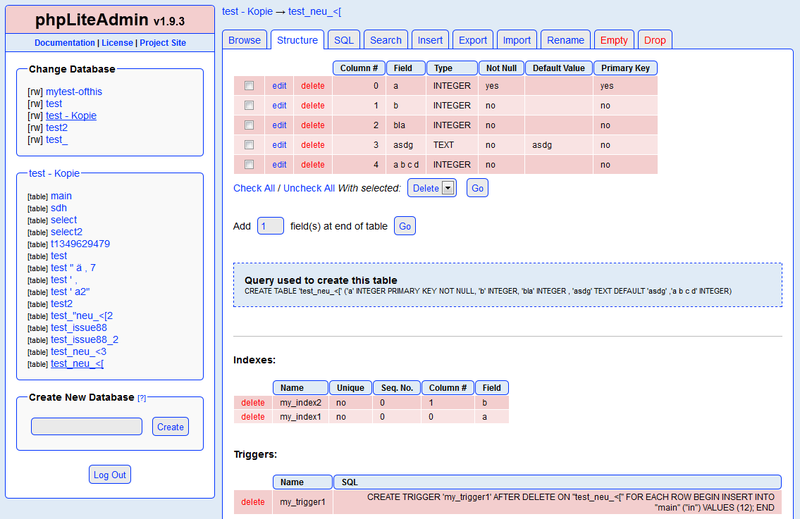 Some minutes ago, I released the new version of phpLiteAdmin, a web management GUI for SQLite databases written in PHP. You can download it from our project site. The new version addresses and mostly fixes lots of issues. Among these, one security issue has been fixed. Therefore, I’d recommend anybody using phpLiteAdmin to update. A lot of work has gone into this release, fixing lots of bugs to make phpLiteAdmin more robust. For example, you can now have tables or columns containing special characters. The ALTER TABLE features have been partly rewritten so they now work a lot more reliable. And lots of other issues have been fixed. Thanks to anybody who reported bugs to the bug tracker. If you still have any problems or suggestions, please let us know on our issue tracker. The most complete Rainbow Table Lookup Site: Google! About three years ago, I wanted to login into an installation of CrazyStat which I had installed back in 2004 in CrazyStat’s early days. Problem was, I had forgotten the password. Of course I could simply change it, but I was curious what the password was and if I would be able to find out. The old version of CrazyStat installed on that server saved the password as an MD5 hash, but without any salt (new versions save salted passwords). So the challenge was to decrypt an MD5 hash which had not been salted before hashing. I looked the hash up in several rainbow tables I found on the web, but did not find any match. Of course, I had not used a simple password, so rainbow tables including dictionaries and brute-force up to several characters were useless. So I thought, well, let’s brute-force it myself. So I wrote a simple brute-force algorithm and let it run on the Hash. I included characters, German special characters (öäüßÖÄÜ), numbers and several other special characters I though I might have used in the password. So this resulted in a huge character set (>80 characters) and a very slow brute-force. I ran it on my home server for several days, but did not succeed. I think I was brute-forcing passwords of 9 characters when I stopped. I just gave up at that time, because it was not that important and just an experiment. Lately, I read that Google is a very good password cracker. Thinking about this, it is obvious: Google indexes the whole web, and there are several MD5 rainbow tables on there, which Google indexes as well. So just google for a hash, and if it is in one of the rainbow tables indexed by Google, you will find it. Also some pages use MD5 for page-IDs which will be indexed by google as well. So I enter the hash I had tried to decrypt three years ago, and it just gave me the password I had searched for straight away! Far more efficient than brute-force or downloading rainbow tables 😉 By the way, the password I searched for had more than 9 characters and is not included in any normal dictionary, although maybe in some password list (but not frequently). I tried several other hashes to see how good Google is. Of course all easy ones are included. But some other more challenging ones were included as well. For example, it knows the hash of “crazystat” (“CrazyStat” is not in there so far). It knows the hash of my hometown (I will just give you the hash here, find out yourself: 97b559a3d65b95dcda14d70e49ef87fc). So compared to most rainbow table lookups I have seen so far, Google performs very well. Of course not everything is in there, and with a good salt string, it should be useless. One test I tried were some random characters, but not so many. I was surprised that Google does not know it. I then used a decrypt/encrypt site that stores every hash it calculates when you encrypt something in a rainbow table. Afterwards, this site was able to decrypt it of course. Now I am waiting how long it takes for Google to index that hash as well. A simple brute-force or a good rainbow table should do to decrypt that. Please leave a comment if you decrypted it. There is at least one md5-decrypt site now that knows this hash, so you might also be able to find this one. But MD5this did not crack it yet and it seems Google is not able to index the md5lookup site I fed with the hash. Well, probably the hash is a bit more difficult to crack than I thought. But somebody must be able to decrypt that. Come on!